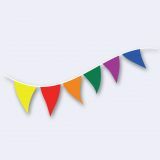 The Multi-Color Pennant Strings from Tuff Flags will add a rustic flair to your summer celebrations and outdoor events. Durable and weatherproof, these pennants feature alternating strands of red, white, blue, yellow, orange and green pennants, which will grab a lot of attention. These light weight pennants flap and fly in the breeze to create a dazzling display of colors. Shop from our collection of Multi-Color Pennants right away and take advantage of our best prices, quick shipping and much more! 100% customer satisfaction guaranteed! We have Multi-Color Pennant Strings in various lengths that range from 30’ to 120’ to match your needs. Multi-Colored Pennant Strings create a festive atmosphere and are used during events, festivals and special promotions. 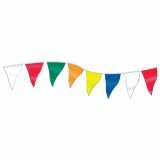 Made of 4-mil Polyethylene, these economy strings are budget friendly and feature 12"x18" multi-colored pennants on a plastic covered, sag-resistant cord. You can even mix and match various pennant strings for a unique display. 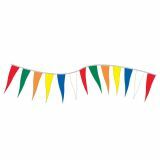 Browse our fabulous collection of Multi-Color Pennant Strings and choose from a variety of lengths and pennant sizes. Custom color sequences available. Need tips? Feel free to call us at our toll free number (888) 287-3524 or email us at customercare@tuffflags.com.